How to restore the coveted crackle-finish paint job on your flat steel Mark I MGB (1963-67) dashboard. If you've got a Mark I MGB (1963-67), congratulations! 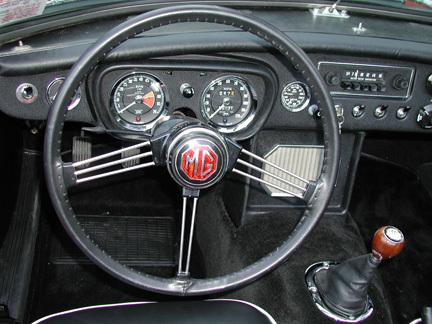 You have a car with the highly prized original style metal dashboard, painted with the matte finish black "crackle paint" that became an MGB trademark. In late 1968, the Mark II models sold in America were redesigned with the highly disdained plastic "Abingdon pillow" dash, padded for the safety-crazed U.S. market. 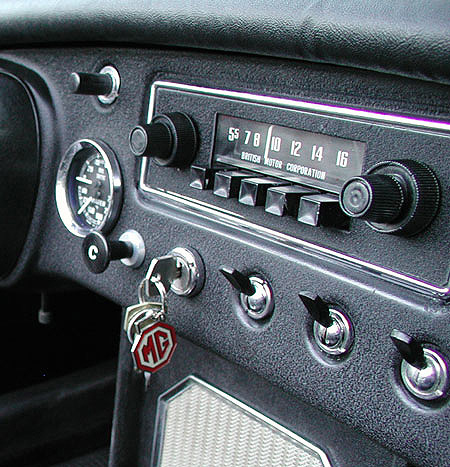 The "pillow" dash eventually gave way to a more attractive modern plastic-covered dashboard, but B's never regained the elegantly simple style of the early metal dash. 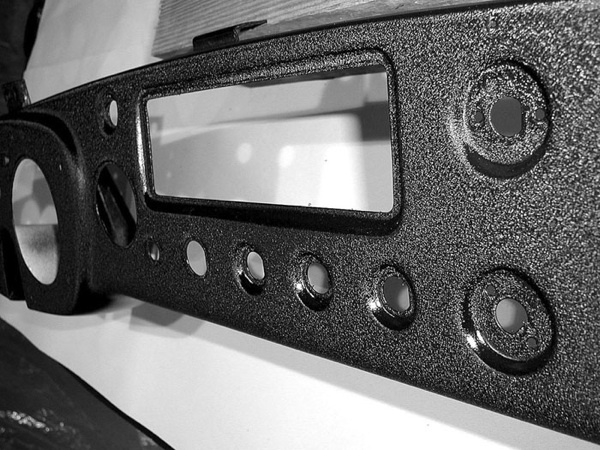 After many years of service, however, inevitably it will be time to repaint your dashboard. (Especially if the previous owner negligently allowed a big gaggle of keys to scrape against the dash under the ignition switch.) It would seem to be a simple job once you get the dash out of the car, but more than one Mark I B owner has been frustrated trying to get a good wrinkle finish on his metal dash. Blocks of wood to prop up the dashboard and glove box door. I used Plasti-Kote #217 Black Wrinkle Paint. The Roadster Factory sells it, and it is also available at any local auto parts store that sells the Plasti-Kote paints. Buy two cans. You may be able to paint the dash with one can, but if you've never used the stuff before, you'll get better results -- and be less frustrated -- if you take the time to practice paint a piece of scrap metal or cardboard first. And it's best not to run out in the middle of the job. You'll first need to remove the chrome trim from the glove box door and radio blanking plate, which are press-fit. (Prongs on the chrome trim snap into holes in the pieces.) Use a small flathead screwdriver to pry it up, gently so you don't wreck the chrome or break the prongs. Also, don't forget to remove the two steel brads that mark the 'off' position of your heater gauges. (They should remain silver colored) From the back of the dash, just carefully pry up the two bendable legs that hold each brad in place. Primer the pieces with any good automotive spray gray primer. (I used gray Plasti-Kote Sandable Primer, T-235.) Allow to dry thoroughly. You may want to repaint the inside of the glove box door and the back of the dash. The inside of the glove box door looks good in a satin black paint. (It's not too flat, not too shiny.) I used a high-gloss white on the back of the dash, recommended to reflect light the next time you find yourself upside down under the dash with a flashlight. You should paint the inside of the door and the back of the dash BEFORE you do the wrinkle paint, of course. Set the dash under the heat lamps, at the usual work light distance. DO NOT get the dash HOT. Just a healthy room temperature warm. You don't need to break a sweat in the room. The face of the dash is what you want to concentrate on, so prop the dash up on wooden blocks so the face of the dash is horizontal and level. Same with the glove box door. (If you just set the pieces down without propping them, the faces won't be level, and you run the risk of having the paint run or sag, plus it will be harder to spray the paint evenly.) As a matter of fact, don't worry about getting the underlip of the dash or the edges of the glove box door perfectly wrinkly. You're not going to see them anyway. As previously noted, it will serve you well to practice paint something, like a piece of sheet metal or smooth cardboard, so you get a feel for the paint and see how it behaves. Because other than the heat, the trick is getting just the right amount of paint down with each layer. The directions call for three "uniform, heavy coats." That means heavier than you're probably used to spraying, but not so heavy that the paint runs and sags. This is where the practice comes in! And, of course, follow the directions and shake the can for a full minute after you hear the ball rattling to mix it up right. And remember to shake intermittently as you continue to spray and before each coat. Here goes. Holding the can 10 to 12 inches away from the piece, spray a nice good first coat, applied in smooth, even, overlapping strokes. Wait 10 minutes. (Watch the clock.) Spray a second nice, good coat. Wait 10 minutes. (Watch the clock!) Spray a third and final nice, good coat. Let it set up a bit, then grab the hair dryer. Hold the dryer over one section, moving it back and forth. Soon you'll see the wrinkles forming. That's the fun part! If you practice your technique first, and faithfully follow these directions, you'll have a dash to be proud of. And remember, if you goof it up the first time and aren't happy with the results, chalk it up to experience and have another go at it. You won't be the first to strip the dash down and do it again. (I did!) Remember, you'll be spending a lot of time staring at this vital piece of your B's interior, and it's worth your time to get it right. Protect your dash beneath the ignition switch. Don't hang a big honkin' set of other keys on your MG's key ring. They'll inevitably bang against the dash and scratch it. For any other keys which you must have on the same ring, use those rubber rings sold as key identifiers in most hardware stores. They go around the key head, and they'll protect your dash paint job quite nicely. Comments on "How To Get a Good Wrinkle Paint Finish"
Great article, good technique, nice finish. However, if you prefer a finer grain, less shine', darker black finish; Sherwin Williams Automotive has a 'Wrinkle Paint that is more in line with the original finish. Use Kim's tips for painting and you will have an OEM look. Quote: "Great article, good technique, nice finish. However, if you prefer a finer grain, less shine', darker black finish; Sherwin Williams Automotive has a 'Wrinkle Paint that is more in line with the original finish. Use Kim's tips for painting and you will have an OEM look." Thanks Michael, great info - I checked the Sherwin-Williams website and they said their brand "Krylon" has Wrinkle Paint under part number CD3370. I suspect the SW paint under the Krylon brand name will be much easier to locate. (Bright lights.) 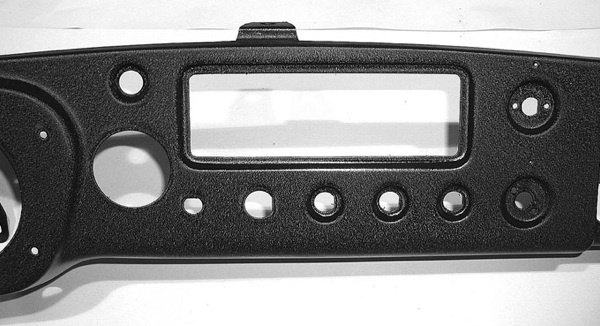 In real life, the finished dash using Plasti-Kote paint is fine grain, not shiny, dark black. great job on the dash!! Im about to restore mine to hopefully similar condition of your example. I feel the hardest part of the whole process however is removing the dash less all the components and then re-assebling it again all the while trying not to scratch the new paint!!! I'll be restoring a '73 MGB's interior in a couple of months, and I'm going for a biscuit color. I've seen how good biscuit looks on everything, including the dash and console. If I use this method, how would I go about getting the color I need? These come aerosols, so matching is a little harder. Do you go over with a wrinkle primer and then the biscuit color? Good article. I used this method for painting the radio console in my '79 Midget. The one thing I would emphasize is the use of a hair dryer or heat gun. I can't stress that enough. My first attempt was in +/- 68Â° garage with space heater blowing directly on the console. 2 days later there were no wrinkles. So, I added two more heavy coats of paint and hit it with a hair dryer for about 30 minutes. That seemed to do the trick and now I can sleep at night. Thanks for the how-to! Hi Kim, Great article.. Not an MG owner, but googled a search got wrinkle paint (how to).. Your article popped up... I was restoring a vintage fishing reel beleive it or not and your directions were perfect... Looks as if it just come from the factory.. With a light sandblasting.... But thanks again!!! Looks beautiful. 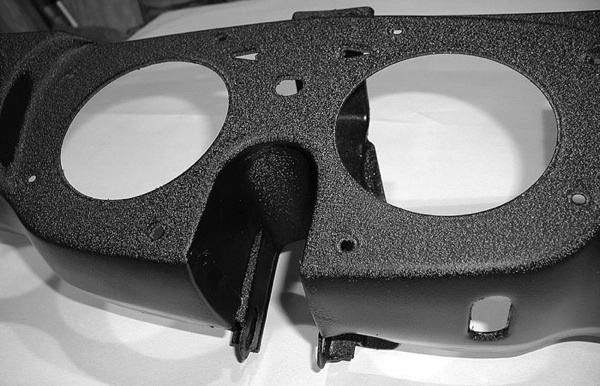 Alternatively, once the dash is out, take it to a powdercoat facility who can match the original wrinkle finish nearly perfectly at very reasonable cost with very long-lasting results!